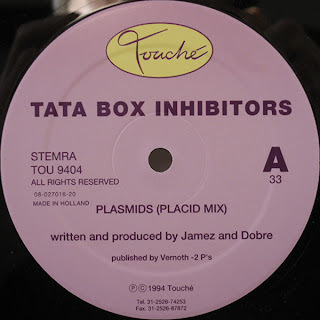 Gaston Steenkist and Alex Dijksterhuis (better known as Dobre & Jamez, The Trancesetters, Jark Prongo, Basco - or any other number of project aliases) pull off one of their finest moments here as the Tata Box Inhibitors. In "Plasmids (Placid Mix)" you have a gradually building epic that isn't techno, trance or acid house - it's a bit of all three. To a certain extent, a lot of their work follows a formula (slow build, big break, big release, long out) but if it works why not. The other two tracks use similar sounds and patterns but to completely different effect. They're also excellent. Check Discogs for other reviews.